95 p. : 13 plates ; 23 cm. "A new species of decapod crustacaen from the Inglis member by Henry B. Roberts": p. 60-67.
by Horace G. Richards and Katherine V.W. Palmer. taken in 1948. The description of this fauna was made by Dr.
Free Institute of Sciences, Philadelphia, Pennsylvania. rocks with similar rocks of the remaining states of the Gulf coast. It is being published as Florida Geological Survey Bulletin No. 35. THE E. 0. PAINTER PRINTING CO., DELAND, FLA.
fusion between these beds and the overlying "Orbitoides limestone,"
based on the correlation of the Applins (1944, p. 1678). an outcrop area instead of from the subsurface. the bed be of lower Jackson or Claiborne age was not stated. According to Vernon (1951, p. 104) Ericson's "Gulf Hammock"
Branch formation and the upper part of the Avon Park limestone. suggested that the term "Gulf Hammock" be abandoned. (1944), Applin and Jordan (1945), Vernon (1951) and others. reader is referred to reports by Cooke (1945) and Vernon (1951). lahassee to Philadelphia and Ithaca for study. examine material in the collections of the Florida Geological Survey. in Algiers, in September, 1952 (Palmer and Richards, 1952). the consequent delay in the completion of this report. discussions and conclusions were written jointly by the two authors. of Italian Mont Postale and Ronca Eocene material in that museum. No. 2 of section described by Vernon (1951, pp. 102-103). northwest quarter of Section 32, Township 14 South, Range 16 East. and specimens of Peneroplid sp. "X (Gen. et. borings made by worms or boring mollusks. peat beds in places, and a pavement-like bryozoa. plid sp. "X," Elphidium sp. "A" are prominent. west quarter of Section 3, Township 17 South, Range 16 East. stone. See Vernon (1951, p. 124, type 2). Lituonella, impressions of Peneroplid sp. "X"
containing many molds of the mollusks above. by Vernon in Bulletin 33.
tariopsis, Bellatara, Hipponix, Pseudocrommium and Conomitra. yielded the best preserved and most abundant specimens. predominantly Eocene subgenus does range into the Oligocene. subdivisional value in the Eocene. a preliminary list as a basis of comparison. Lyria pycnopleura eocenia, n. subsp. Tectariopsis (?) avonensis Palmer, n.sp. spiral threads are more numerous. Dimensions.-Adult; height, 15 mm. ; greatest diameter, 18 mm. young: height, 9 mm. ; greatest diameter, 8 mm. Types.-Holotype, No. 1-7391; paratypes, Nos. 1-7392-94, Fla.
Occurrence.-Avon Park limestone,'loc. L-73, Fla. Geol. Surv. which was placed in Calcar by Cossmann (Essais Paleonconch. ture is unknown the generic placement cannot be definite. as this Florida shell and is of a different shape. form and sculpture justifies its description. Dimensions.-Height, 27 mm. ; greatest diameter, 29 mm. Holotype.-No. 1-7395, Fla. Geol. Surv. Occurrence.-Inglis member, Moodys Branch formation, loc. Notulae Naturae, No. 177, p. 2, pls. 1, 2.
cussed by Vernon (1951 p. 123, 124) and several sections are given. V. floridanus is mentioned in the fauna. Eocene. In California and Jamaica it occurs in the middle Eocene. In Florida, V. floridanus is present in the lower upper Eocene. in the Avon Park limestone, middle Eocene. the teeth the Florida shells are retained in the distinct species. dividuals has the teeth preserved. Specimens figured.-Nos. 1-7396, 1-7397, 1-7398, Fla. Geol. Surv. sented by Palmer (1937), Bowles (1939), and Palmer (1947). of the Claiborne group and T. pcrdita Conrad are representatives. were temporarily so assigned (see list, p. 119, Bull. 33, Fla. Geol. Types.-Holotype, No. 1-7399; paratypes, Nos. 1-7400-7403, Fla.
L-93 (type) and L-135, Fla. Geol. Surv. ent on two whorls. The shell would have been slender. Specimen figured.-No. 1-7404, Fla. Geol. Surv. least four cerithiid species in the present small collection. except the basal portion of the body whorl. in the Indo-Pacific (Davies, 1935). (1890, pl. XI, fig. 7; Dall, 1915, pl. 14, fig. 3) in the coarse ribbing. and less concave basal outline of the body whorl. "Potamides"
transecta is from the lower Miocene Tampa limestone. placed "Potamides" transecta in Lampanella. there are less spiral ribs on the whorls of the spire. Types.-Holotype, No. 1-7405; paratype, 1-7406, Fla. Geol. Surv. Occurrencc.-Inglis member, Moodys Branch formation, loc. species is marine. The discovery of specimens of B. americana, B.
lower upper Eocene in Florida. as well developed in each horizon. are present. They are not noticeable beyond the sixth whorl. strong nodes on the adult whorls. B. americana differs from B.
ence of the subcentral incised line on B. americana. ithium gomphoceras Bayan" figured by De Gregorio (Ann. Geol. Moodys Branch formation, loc. L-93 (type), L-135, Fla. Geol. Surv. whorls there is only one spiral. The sutural rib may be finely nodose. on the penultimate whorl. This character reveals generic affinity. The canal is short; aperture unknown. to divide the specimens of Bellatara into three species. (all plastotypes), Fla. Geol. Surv. member, Moodys Branch formation, loc. C-11 (type), Fla. Geol. shells of 25+ mm. in length and of at least eight whorls are smooth. The canal is short; aperture not known. 1894, pl. IV, figs. 88-93) as well as in Oppenheim (Palaeont., vol. suite of what were preliminarily referred to as Campanile, n.sp. (see Fla. Geol. Sur., Bull. 33, p. 119). The form is fairly abundant. Types.-Holotype, No. 1-7414 (plastotype) ; paratypes, Nos. 1-7415, 7416, 7417, Fla. Geol. Surv. Moodys Branch formation, loc. L-135 (type), Fla. Geol. Surv. Whitfield, 1865, p. 265, pl. 27, fig. 8. Vertagus wechesensis Stenzel in Renick and Stenzel, 1931, Univ. Texas Pub., Bull., No. 3101, pl. VI, fig. 8. Clava ("Ochetoclava") vincta Palmer, 1937, p. 217 in part, pl. 29, figs. 15, 16 not C. vinctum Whitfield, 1865. Clava wechesensis (Stenzel), 1938, Univ. Texas Pub., Bull., No. ium' Bruguiere, 1789, nor Clava Martyn,2 1784, type species C.
losum Bruguiere, 1789. This is the type species used by Cossmann, 1906.
generic names, including Clava, were on a binomial basis. than in the Floridian, B. americana. The canal is longer in B.
wechesensis than in the Floridian species. of Bolivar, Colombia, in which he pointed out an affinity with B.
Oligocene. Clark included both formations in the upper Eocene. Pissarro (Icon. comp. Coq. fos. l'Eocene Env. Paris, 1910-1913, pl. under "Cerithium corvinum" (Brongniart, 1823). the Eocene of Mt. Pulli, Italy, as C. fontis felsinae Oppenheim. Types.-Holotype, No. 1-7641, Fla. Geol. Surv. L-93, C-11 Fla. Geol. Surv. coarse radiating ribs which have interspaces about equal in size. the umbonal area retains the spiral ribs. 1913, t. 2, pl. XII, figs. 74-1). The species is well represented in the Inglis member, loc. L-93. One specimen was collected from the Avon Park limestone. Moodys Branch formation, loc. L-93 (type). Trochus aperta Solander in Brander, 1766, p. 9, pl. 1, figs. 1, 2. For continued synonymy see Palmer, 1937, p. 145.
and sculpture well preserved, are typical of the species. Specimens.-- o. 1-7422, 7423 (figured), 7424, 7425, Fla. Geol. is not so well preserved. Specimen figured.-No. 1-7426, Fla. Geol. Surv. cemented to the whorls were coarse. holotype to identify the distinction with certainty. Type.-Holotype, No. 1-7428, Fla. Geol. Surv. Type species, L. floridana Palmer, n.sp. cerned over the body whorl. in Laevella, the labrum is more extended and the surface is smooth. dant at the type locality. Types.-Holotype, No. 1-7436: paratypes, 1-7437, 7438, Fla.
Occurrcnce.-Inglis member, Moodys Branch formation, loc. L-93 (type) and C-11, Fla. Geol. Surv. Terebellum (Seraphs) belemnitum Palmer, n.sp. 11) from the Domengine, lower upper Eocene of California. the Eocene of the southern United States. "T. fusiforme Lamarck"
is not a Seraphs but Terebellum s.s., with well-marked sutures. medially. The species was never named. Types.-Holotype, No. 1-7642; paratype, No. 1-7643, Fla. Geol. Cypraea (Cypraedia) fenestralis Conrad, 1854, Wailes, Rept. 1939, Reprint, Bull. Amer. Paleont., vol. XXIV, No. 86, pp. 8, 19, pl. 4, figs. 5a, 5b. figs. 9, 10, 17, 18.
served sculpture were recovered in the Inglis member sediments. formation in the Mississippi embayment area. Specimens figured.-Nos. 1-7439, 7440, Fla. Geol. Surv. No. L-93, Fla. Geol. Surv. this species may be known by the channelled suture. narrower whorls and more exposed umbilical sheath than A.
Types.-Holotype, No. 1-7434; paratype, No. 1-7435, Fla. Geol. C-11 (type) ; L-139, Fla. Geol. Surv. specimens they are intimated most strongly just below the suture. margin of the callus recurved below and flaring. smaller, narrower, and by the less channelled sutural area. the upper Eocene of Colombia (Clark, 1946, p. 19). n.sp. (Fla. Geol. Sur., Bull. 33, p. 120). 1941, p. 1021, fig. 2927 P. bulbiformis (Sowerby), type species). Univ. Washington Publ. Geol., vol. 5, pt. II, 1943, p. 345, pl. 70, figs. L-93 (type), loc. L-139, L-135, C-11, Fla. Geol. Surv. tudinal lines are coarse at regular intervals. ternal mold of the same which includes the complete body whorl. trated. That of P. occiduum is reduced in size. Type.-Holotype, No. 1-7433, Fla. Geol. Surv. Occurrence.-Avon Park limestone, loc. L-76, Fla. Geol. Surv. Soc. Nat. Hist., Jour., vol. IX, No. 2, p. 50.
p. 336, pl. 44, figs. 7-9.
specific characters of P. jacksonensis rather than to those of P.
Claiborne form and the Jackson species. microscopic spiral thread in the interspaces as in P. jacksonensis. more elongate. The Florida shell has the blunt canal. Specimen figured.-No. 1-7644, Fla. Geol. Surv. (Conrad). The spinous character of the longitudinal folds of P.
the longitudinal ridges the length of the whorl as in P. gunteri. tion) Eocene of the Mississippi embayment area. Types.-Holotype, No. 1-7645; paratypes, 1-7646-49, Fla. Geol. the callus is strongly plicate in the columellar area. Olivella (Callianax) poinciana Palmer, n.sp. Eocene from Asia, Europe to the Americas. two of which are figured herein. Types.-Holotype, No. 1-7607; paratype, 1-7608, Fla. Geol. Surv. Occurrence.- Inglis member, Moodys Branch formation, loc. preserved on the columella, there probably were four. whorl. No striations are visible on the apical whorls. Specimens figured.-Nos. 1-7609, 1-7610, Fla. Geol. Surv. member, Moodys Branch formation, loc. L-93, Fla. Geol. Surv. the spiral lines are stronger than over the middle area of the shell. the smoothest Lapparia, L. pactilis. that subspecies in the longitudinal folds. Types.-Holotype, No. 1-7611; paratypes, Nos. 1-7612, 13, Fla.
spines appear like nodes on the upper whorls of the spire. The Florida species also resembles E. douvillei Olsson (1930, p.
north of Negritos, Peru. E. douvillei has a broader spire than E.
Types.-Holotype, No. 1-7614; paratypes, Nos. 1-7615, 16, Fla.
the body whorl is covered with conspicuous spiral threads. species lacks the spiral lines and the body whorl is more elongate. indenta Conrad in the Crockett formation, middle Eocene of Texas. stronger over the ifody whorl and a more elongate body whorl. Types.-Holotype, No. 1-7617; paratypes, 1-7618, 1-7619, Fla.
L-93 (type, and C-11, Fla. Geol. Surv. Type species, Sycospira eocenica Palmer, n.sp. the young of above dimension. This genus is known by two specimens, an adult and a juvenile. is similar to that of Pterospira and was tentatively placed there. abstract of the work (Palmer and Richards, 1952). known the species is unique. Types.-Holotype, No. 1-7620; paratype, 1-7621, Fla. Geol. Surv. have fine intervening threads; four or five columellar plications. finest spiral threads or ribs and C. obsoleta, the coarsest. mately 55 mm. in height and 32 mm., greatest diameter. Types.-Holotype, 1-7622; paratypes, 1-7623, 7624, Fla. Geol. Type species, Voluticella levensis Palmer n.sp. the last half whorl of the nucleus is smooth and narrow, 3 mm. lata stenzeli Palmer and C. turner Palmer have an elevated spire. The nuclear whorls of Voluticella are flatter than those of Caricella. cene) of Jhirak, in India which Cossmann and Pissarro (1909, p.
strong and the posterior weak as in V. levensis. the direction of the ribs. Description as for the genus. Types.-Holotype, No. 1-7625; paratypes, Nos. 1-7626-7628, Fla.
on columella, the anterior ones are larger and more regular. more longitudinal ribs than L. eocenia has. Holotype.-No. 1-7629 (plastotype), Fla. Geol. Surv. Lyria pycnopleura eocenia Palmer, n.subsp. than on the Miocene species. one paratype which are smaller than the holotype of L. pycnopleura. That species ranged to an altitude of 63 mm. Types.-Holotype, No. 1-7630; paratype, No. 1-7631, Fla. Geol. thick; labial callus well-developed bearing three plications. having two stout revolving ribs on the whorls of the spire. P.
nal folds on P. floridana are more pronounced than on P. heilprini. The species is abundant at the type locality. ameter. The specimen is figured herein (1-7634, Fla. Geol. Surv.). spiral ribs are narrower in width anteriorly. men measures 40 mm. in height and 18 mm., greatest width. with the sides of the shell in S. richardsi than in S. jacksonensis. Florida species. Type material of both species has been compared. appears to be of the same group of Scaphander as S. richardsi. Named in honor of Dr. Horace G. Richards. Types.-Holotype, No. 1-7635; paratypes, 1-7636-39, Fla. Geol. and figured specimens are given under the description of plates. is given in Part 4 of this report. nodes (or with nodes worn off), the interspaces appearing as striae. irregularly spaced concentric growth lines. stages of the Mississippi embayment (See Harris, 1919, p. 54, pl. to the Claiborne B. rhomboidella Lea. Named in honor of Dr. Katherine V. W. Palmer. Type-Holotype No. 1-7551, Fla. Geol. Surv. Occurrence.-Inglis member of Moodys Branch formation, Loc. Barbatia ? inglisia Richards, n.sp. and by having the grooves deeper than the rib interspaces. Type.-Holotype: No. 1-7550, Fla. Geol. Surv. Glycymeris lisbonensis Harris, 1919, Bull. Amer. Paleont., vol. separated from G. idonea Conrad by their more rounded shape. Mountain formations) Eocene of Alabama and Mississippi. Specimens figured.-Nos. 1-7552, 1-7553, Fla. Geol. Surv. 1898, Wagner Free Inst. Sci., Phila., Trans. vol. 3, p. 682, p.
No. 117, p. 20, pl. 3, figs. 1-9. Inglis limestone at locality L-135. (Fla. Geol. Surv. 1-7586). Anomia ephippioides var. lisbonensis Aldrich, 1886, Geol. Surv. Ala., p. 41, pl. 4, fig. 6. Trans. vol. 3, p. 781; Harris, 1919, Bull. Amer. Paleont., vol. 6, No. 31, p. 17, pl. 11, figs. 6-10.
determine it completely as to species. Specimen figured.-No. 1-7531, Fla. Geol. Surv. men measures 50.7 mm. by 35.8 mm. Occurrence.-Inglis member, Moodys Branch formation: L-93. Crassatella inglisia Richards n. sp. nounced, concentric ridges with interspaces wider than the ridges. beak but this sculpture is still distinct on the beak. centered and by being less elongate. Types.-Holotype No. 1-7541, paratype No. 1-7542, Fla. Geol. L-93, L-135, VL-187, Avon Park limestone: Loc. L-92. 1919, Bull. Amer. Paleont., vol. 8, No. 33, p. 14, pl. 2, fig. 4.
proportions as shown in the figure. of these, from Locality C-1l, is figured. Occurrence.-Inglis member, Moodys Branch formation Loc. Plate 10, figures 1, 2. Venericardia scabricostata Guppy, 1866, Quat. Jour. Geol. Soc. London, vol. 22, p. 292, pl. 18, fig. 10; Maury, 1919, Bull. Amer. Paleont., vol. 5, No. 29, p. 362, pl. 33, fig. 1. This species is common at several localities in the Inglis member. nodes on the ribs less conspicuous. ber, Moodys Branch formation, loc. L-93, L-139. beak and lose their identity. V. diversidentata. Known from three specimens. Type.-Holotype, No. 1-7539 Fla. Geol. Surv. 1901, U.S. Nat. Mus., Proc., vol. 23, No. 1237, p. 806. 215 mm. and 245 mm. by 220 mm. respectively (estimated). been reported from the Eocene of the Mississippi embayment. Specimen figured.-No. 1-7562, Fla. Geol. Surv. ber, Moodys Branch formation, Loc. C-11. Phacoides (Here) wacissanus Dall, Wagner Free Inst. Sci. Phila. Trans., vol. 3, p. 1365, pl. 50, fig. 15. No. 138, pl. 10, fig. 6. Specimen figured.-I-7563, Fla. Geol. Surv. and has considerably fainter concentric lines of growth. Specimen figured.-I-7564, Fla. Geol. Surv. Occurrence.-Avon Park limestone, loc. L-118A. with uneven edges. A trace of radial grooves on the beak. from the Eocene of eastern North America. Type.-Holotype, No. 1-7567, Fla. Geol. Surv. Fimbria vernoni Richards, n. sp. on the slope and at the margin the radial ribs are more pronounced. Several (8) impressed growth lines are present on the holotype. thermore, F. vernoni is more rounded than the Claiborne form. Basin, but the American form was later shown to be distinct. closer to the French form. concentric ribs are more widely spaced. generic name Fimbria for the more widely used name Corbis. Types.-Holotype, No. 1-7556; paratype, 1-7557, Fla. Geol. Surv. Fimbria olssoni Richards, n. sp. Shell elliptical in lateral view with beaks elevated as illustrated. as in F. vernoni. Anterior slope less abrupt than in F. vernoni. rower, fewer, and more irregular than in F. vernoni. Named in honor of Axel Olsson. Type.-Holotype, No. 1-7558, Fla. Geol. Surv. (plastotype). Occurrence.--Avon Park limestone: loc. L-118A. Cardium (Dinocardium) levyi Richards, n. sp. of prominent spines on the ribs. Interior of shell not exposed. Very closely resembles the shell which Harris (1951, p. 23, pi. the Guajalote formation (lower Miocene) of northeastern Mexico. Type.-Holotype, No. 1-7568, Fla. Geol. Surv. Cardium (Trigoniocardium) protoaliculum Richards, n. sp. do not appear on the nodes. The species is close to C. alicula Dall (1900, p. 1103, pl. 40, fig. more conspicuous nodes. Fairly common. Cardium (Trachycardium) claibornensis Aldrich, 1911, Bull. Bull. Amer. Paleont., vol. 6, No. 31, p. 132, pl. 41, figs. 8, 9.
them completely. They have been compared with the type of C.
Specimens figured.-Nos. 1-7569; 1-7570, Fla. Geol. Surv. L-93. Avon Park limestone, loc. L-73. Cardium (Anthocardia?) avonum Richards, n. sp. most conspicuously on anterior slope where nodes are present. terior spines and in the number of ribs. Known only from several plastocasts from locality L-76. Type.-Holotype (plastocast), No. 1-7575, Fla. Geol. Surv. Occurrence.-Avon Park limestone, loc. L-76. Gari jacksonense Harris, 1946, Bull. Amer. Paleont. vol. 30, No. 117, p. 97, pl. 21, figs. 12, 14. Specimen figured.-No. 1-7561, Fla. Geol. Surv. Callista annexa Palmer, 1929, Paleont. Amer. vol. 1, p. 283, pl. p. 95, pl. 21, figs. 6-9.
ovate, posteriorly cuneate and abruptly rounded at the extremity. Dimensions.-Length 21.1 mm. ; width 28.0 mm. (figured). Specimens figured.-No. 1-7578, Fla. Geol. Surv. Moodys Branch formation, loc. L-93. Blagraveia ? gunteri Richards, n. sp. ferred to this species (1-7580). Type.-Holotype, No. 1-7579, Fla. Geol. Surv. L-93; C-11. Avon Park limestone, loc. L-118. Corbula densata Conrad, 1854, in Wailes, Rept. Geol. and Agric. Miss., p. 289, pl. 14, fig. 9; Harris, 1946, Bull. Amer. Paleont. vol. 30, No. 117, p. 115, pl. 24, figs. 11-15, 17-21. Claiborne form the ribs are slightly more conspicuous. Specimens figured.-Nos. 1-7582; 1-7583, Fla. Geol. Surv. Eocene (Lutetian), a dating previously assigned by Vernon (1951). the gastropods is less apparent in the case of the pelecypods. ties for fossils are L-93, L-135, L-139 and C-11. as a Recent species from Australia. lombia, Paris Basin and Italy. n.sp. I Subgenus; Eocene Oligocene. South America, and West Indies. A = Avon Park limestone; I = Inglis member. ritella, Xenophora, Conus and "Cerithium." Eocene of the Mississippi embayment. 1934, p. 104, etc. ; Cox, 1931, p. 177). West Indies and Mexico than to the Gulf Coast of the United States. one or more low sea levels of Eocene time. Inglis and Avon Park formations in Florida. time and may have produced such a barrier in northern Florida. Age of the Avon Park and Inglis Faunas. gested by Vernon (1951, p. 112). 1937, and Harris and Palmer, 1947; for foreign references see Cox, 1930. ADANSON, MICHEL. 1757 Histoire naturelle du Senegal. Coquillages. 1749, 50, 51, 52, and 53. Paris, 275 pp., 19 pls. and Mississippi, with descriptions of new species. Cincinnati Soc. Nat. Hist., vol. VIII, No. 2. pp. 145-153, pl. 2, 3.
tiary fossils of Alabama and Mississippi. Geol. Sur. Alabama, Bull. No. 1, pt. 1, 60 pp. 6 pls. in Florida and Adjacent States. U. S. Geol. Surv., Circular 91.
graphy and Structure of Florida and Southern Georgia. Bull. A.A.P.G. Atlantic. Johnsonia, vol. 1 No. 5, 11 pp., 5 pls. No. 3, pp. 267-336, pls. 31-34.
collect, et in Musaeo Britannico deposit. London. 43 pp., 9 pls. meme epoque. Paris, pp. IV, 86, 6 pls. the flora and fauna of that Island. Ann. Mag. Nat. Hist., vol. IX, pp. 126 pp., 27 pls., map. Turgurium in the western Atlantic. Johnsonia, vol. I, No. 8, 8 pp., 1 pl. in Florida. Fla. Geol. Surv. Bull. 26, 168 pp. COOKE, C. WYTHE 1915 The Age of the Ocala limestone. U.S. Geol. Surv. Prof. Paper 95, pp. 107-117.
graphy of South Carolina. U. S. Geol. Surv., Prof. Paper 243-B. de l'Eocene des environs de Paris. Ann. Soc. Roy. Malac. Belgique. see Harris and Palmer, 1946. COSSMANN, MAURICE 1895-1925. Essais de Paleoconchologie Comparee. 13 liv. ; 7 liv., 1906; 11 liv., 13 liv., 1925. n.s., vol. III, mem. No. 1, 83 pp., VIII pls. neighboring areas; Pt. VIII. The Mollusca of the Hangu shales. Palaeont. Indica, n.s., vol. XV, pp. 129-222, pls. XVII-XXII. Trans., vol. LVII, pp. 25-92, 14 pls. COX, LESLIE R. 1931. New lamellibranch genera from the Tethyan Eocene. Proc. Malac. Soc. London Vol. 19, pp. 177-187, 2 pls. COX, LESLIE R. 1952 Cretaceous and Eocene Fossils from the Gold Coast. Gold Coast Geol. Surv. Bull. 17.
pls. IV, V, XII, fig. 7.
plete reference, See Harris and Palmer, 1946. DALL, WM. H. 1901 A gigantic fossil Lucina. Nautilus Vol. 15, pp. 40-42. London. 406 pp., 565 figs. environs de Paris. 2 vols. Text and atlas; vol. 2, Gasteropodes. Paris. DURHAM, J. WYATT. See Clark, B. and Durham, J. W.
N.S. Vol. 102, No. 2644, p. 234. FAVRE, JULES et al 1918. Catalogue illustre de la collection Lamarck. Mus. Hist. nat. Geneve. 117 pls. Moodys Branch formation. Fla. Geol. Surv. Bull. 34, pp. 45-101. FISCHER, PAUL 1880-1887. Manuel de conchyliologie . Paris. 1369 pp. See data according to page, record before title page. FISCHER, PAUL 1885. Bayle MS. names in Man. Conchyliol. FISCHER-PIETTE, E. and FISCHER, P. H. 1940. Identification du "Cerite"
d'Adanson. Bull. Mus. nat. d'Hist. nat., 2d ser. t. XII, No. 3, pp. 11-118. Tertiary and Cretaceous fossils. Acad. Nat. Sci. Philadelphia, Jour. 2d. ser., vol. IV, pp. 375-406, pls. LXVII-LXIX. Buccinidae. U.S. Geol. Surv., Prof. Paper 193-B, pp. 18-44, pls. 6-8.
northeastern Mexico. Geol. Soc. Amer., Mem. 11, 332 pp., 27 pls., map. Parisien) de Mont Postale. Ann. Geol. et Paleont., 14 liv., pp. 55, 9 pls. Ronca. Ann. Geol. et Paleont., 21 liv., 164 pp., 27 pls. l'Alabama. Ann. Geol. et Paleont. 7, 8 liv., 316 pp., 46 pls. tralasian Tertiary Mollusca. 407 pp., 8 pls. HARRIS, GILBERT D. 1890. The genus Terebellum in American Tertiaries. Amer. Geol., vol. 5, p. 315. HARRIS, G. D. 1919 Pelecypoda of the St. Maurice and Claiborne stages. Bull. Amer. Paleont. Vol. 6 (No. 31) pp. 1-268, 59 pls. HARRIS, GILBERT D. 1937. Turrid illustrations, mostly Claibornian. Palaeont. Amer., vol. II, no. 7, pp. 23-144, pls. 2-15. HARRIS, G. D. with VAN WINKLE, KATHERINE 1919, which see. HARRIS, G. D. 1951 Preliminary note on Ocala bivalves. Bull. Amer. Paleont. Vol. 33 (No. 138) pp. 1-54, 13 pls. HEILPRIN, ANGELO 1887. Explorations on the west coast of Florida. Wagner Free Inst. Sci. Philadelphia, Trans. 1, 134 pp. pls. Florida. Fla. Geol. Surv. Bull. 34, pp., 1-43. Brazos River. Acad. Nat. Sci. Philadelphia, Proc., pp. 89-160.
the Choctawhatchee formation of Florida. Florida Geol. Surv., Bull. No. 3, 142 pp. 21 pls. MAURY, CARLOTTA 1917. Santo Domingo type sections and fossils Bull. Terr., vol. IX, 629 pp., 45 pls. NICOL, DAVID 1950. Recent species of the lucinoid pelecypod Fimbria. Jour. Wash. Acad. Sci., Vol. 40, pp. 82-87. No. 62, 1930, 96 pp., 12 pls. Pt. IV. The Peruvian Oligocene. Ibid, No. 63, 1931. 164 pp., 21 pls. pp. 137-348 pls. XIII-XXI, 1901. Leif. 2, pp. 165-348, pls. XVIII-XXVII, 1906. States. Bull. Amer. Paleont., vol. VII, No. 32, pt. I, text, 548 pp., pt. II, plates, pp. 549-730, 90 pls. Florida Eocene. Acad. Nat. Sci. Phila. Notula Naturae No. 177. pp. 1-6. STENZEL, HENRYK B. 1931. See under Renick, B. C. and Stenzel, H. B.
STENZEL, HENRYK B. 1938. The geology of Leon County, Texas. Univ. Texas Pub., No. 3818, 295 pp., text figs. and Turritellidae from the Paleocene and Eocene of the Gulf Coast. Univ. Texas Pub. No. 3945, pp. 795-846, pls. 43-47.
fossils of North America. Eocene. Gastropoda. Bur. Ec. Geol. Austin. 92 cards, text and figs. pods. Acad. Nat. Sci. Philadelphia, Proc. for 1926, vol. LXXVIII, pp. THOMPSON, T. F. See under Woodring, W. P. and Thompson, T. F.
lusca. Geol Magazine, Vol. 8, pp. 337-367.
logica. Arch. Naturgesch, 92, abt. Heft 8, pp. 30-75.
interesting molluscan species from the East Coast of America. Bull. Amer. Paleont., vol VIII, No. 33, pp. 1-32, 3 pls. VERNON, ROBERT 0. 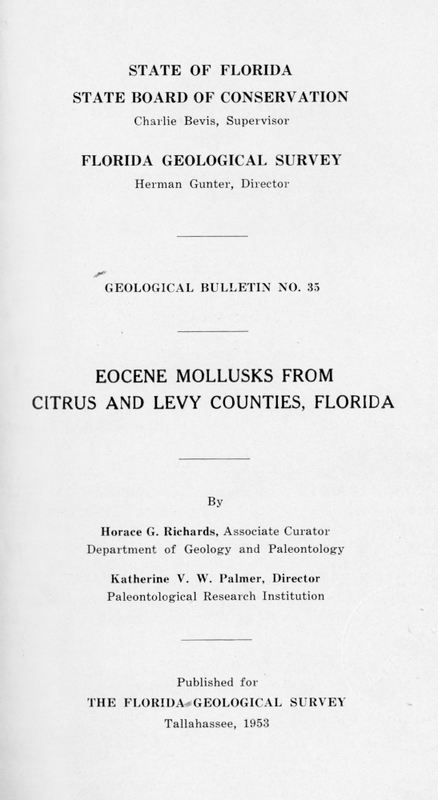 1951 Geology of Citrus and Levy Counties, Florida. Fla. Geol. Surv. Bull. 33, pp. 1-256.
pp. 381-390, pls. 25, 26. Arroyo Hondo formations of the California Eocene. New York Acad. Sci., Ann., vol. XXXVIII, 246 pp., 22 pls. vol. 5, Pt. II, Mollusca; Gastropoda; Cephalopoda; Arthropoda. Pp. Teil 7, Allgemeiner Teil und Prosobranchia. Pp. I-XII, 1507-1639, 1944.
fossils. Amer. Jour. Conch., vol. I, pp. 259-268, pl. 27. Proc., vol. XVIII, Pt. V, pp. 228-229.
tions of Panama Canal and adjoining parts of Panama. Bull. Amer. Assoc. Petr. Geol. vol. 33, No. 2, pp. 223-247, 2 figs. cal. Soc. London, Proc., vol. XXVIII, pt. 1, pp. 10-30, figs. 1-47.
the distal height of the hand. ida Geological Survey Locality L-93. right, 7 left), of which two retain a portion of the fixed finger. minor hands,-2 right, 1 left. Description of holotype.-A left major manus of the female. below the articular node. Above the node the margin is broken. this tubercle, a granule near the upper margin. on the hinge; dactylar orifice large. thickness, the greatest thickness-unless stated otherwise. line is not preserved in the holotype. below it, a shallow sulcus. Posterior margin is concave. upward to a broad arch above the body of the hand. Holotype (left, female) 6.6 6.5 2.7mm. pp. 389, 392, pl. 15, figs. 3, 4. Quaternary Periods in the Northwest Port of Peru: p. 115, pl. XVII, figs. three small tubercles descend from the hinge tubercle. from Florida. Apparently it is the species referred to by Vernon,"
'the shrimp claw limestone' in the process of mapping." Florida: Fla. Geol. Survey Bull. 33, p. 117. mm., greatest diameter. Loc. L-93. width, 27 mm., length. Loc. L-135. typc (plastotype), No. 1-7391, 18 mm., height, 19 mm., greatest diameter. 12. Astraea withlacoochensis Palmer, n. sp. Holotype (plastotype), No. 1-73%5, 25 mm., height, 39 mm., greatest diameter. Loc. L-135. (plastotype), No. 1-7410, 28 mm., height; 16 mm., greatest diamd'er. height, 6 mm., greatest diameter. 31 mm., greatest diameter. Lpc. C-1l. mm., height, 38 mm., greatest diameter. Loc. C-1l. 10, 11, 13. Bellatara floridana Palmer, n. sp. 10, paratype (plastotype), No. type, No. 1-7416, 60+ mm., height, 24 mm., greatest diameter. Loc. 14. Conus sp. B. No. 1-7634, 23 mm., height, 12 mm., greatest diameter. height, 20 mm., greatest diameter. Loc. L-93. 10 mm., height, 18 mm.+, greatest diameter. Loc. L-73. 9, 12. Terebellum (Seraphs) belemnitum Palmer, n. sp. 9, holotype, No. I-7642, 49 mm., height, 15 mm., greatest diameter. 12, paratype, No. 1-7643, 27 mm., height, 10 mm., greatest diameter. Loc. L-93. (plastotype), No. 1-7434, 47 mm., height, 47 mm., greatest diameter. mm., height of fragment, 63 mm., greatest diameter. Loc. L-76. type), No. 1-7640, 70 mm., height, 42 mm., greatest diameter. Loc. height, 16 mm., greatest diameter. Loc. L-93. mm., height, 10 mm., greatest diameter. Loc. L-93. height, 26 mm., greatest diameter. Loc. L-93. mm., height, 21 mm., greatest diameter. Loc. L-93. height, 11 mm., greatest diameter. Loc. L-93. height, 10 mm., greatest diameter. Loc. L-93. 9, 14. Concmitra sp. 9, No. 1-7610, 14 mm., height, 6 mm., greatest diameter. 11 mm., height, 6 mm., greatest diameter. Loc. L-93. height, 17 mm., greatest diameter. Loc. L-93. height, 40+ mm., greatest diameter. Loc. L-93. 8. Diastoma sp. No. 1-7404, 25 mm., height, 6 mm., greatest diameter. height, 8 mm., greatest diameter. Loc. L-93. height, 75 mm., greatest diameter. 2, paratype (plastotype), No. 12 mm., greatest diameter. Loc. L-93. No. 1-7617, 29 mm., height, 13 mm., greatest diameter. Loc. L-93. mm., height, 13+ mm., greatest diameter. Loc. C-11. 35 mm., height, 14 mm., greatest diameter. Loc. L-93. height, 21.2 mm., length. Loc. L-93. height, 29.0 mm., length. Loc. L-93. length. 4, No. 1-7552, 19.2 mm., height, 20.2 mm., length. Loc. L-93. 5. Anomia cf. A lisbonensis Aldrich. No. 1-7531, 26.5 mm., length. Loc. 6. Ostrea sp. No. 1-5338, 26.4 mm., length. Loc. L-93. length, 16.0 mm., height. Loc. L-93. 8. Volsella sp. No. 1-7560, 50.7 mm., height, 35.8 mm., length (incomplete). 24.1 mm., height. Loc. L-92. 12.5 mm., length. 2. No. 1-7534, 9.4 mm., height, 9.3 mm., length. Loc. 3. Crassatella sp. No. 1-7549, 45.9 mm., height, 59.3 mm., length. Loc. 19.5 mm., height, 17.5 mm., length. Loc. L-93. 7. "Lucinoid." No. 1-7587, 38.0 mm., height, 37.5 mm., length. Loc. L-139. 8. Here sp. No. 1-7564, 14.4 mm., height, 11.3 mm., length. Loc. L-118. 43.9 mm., length. Loc. L-118. 2-4. Fimbria vernoni Richards, n. sp. 2, No. 1-7557, 24.0 mm., height. Loc. mm., height, 30.0 mm., length. Loc. L-93. 39.0 mm., height, 35.7 mm., length. Loc. L-76 . 8. Dentalium sp. No. 1-7588, 28.5 mm., length. Loc. L-93. (plastocast), 29.0 mm., height, 27.0 mm., length. Loc. L-76. 19.0 mm., length. Loc. L-93. 18.7 mm., length. Loc. L-93. length. 9, No. 1-7583, 11.8 mm., height, 17.5 mm., length. Loc. L-93. Callianassa inglisestris Roberts, n. sp. inner, lower, and front views. Specimens 8.5 x 6.5 x 2.7 mm. and inner views. Specimen 9.4 x 7.7 mm. and upper views; specimen 13.1 x 7.7 x 3.7 mm. tilted upward to show prominence and tooth on interdigital sinus. Specimen 10.3 x 3.3 mm. first pair; outer and inner views; specimen 5.7 x 4.8 mm. stump for fixed finger; outer view; specimen 11.8 x 8.6. mm. Inglis, Levy County, Florida, Fla. Geol. Surv. Locality L-93.